Writing computer software remains difficult and hard. Most computer code is hard to read and quite intimidating. This does not have to be the case. Our software development environments should be designed in such a way that they make it easy to read and to write code for day to day tasks, for those problems that are solved. Studying a list of example tasks — one-liners, expressions and snippets — is an excellent way to check out candidate programming languages. Here is a list with solutions implemented in Pharo — an immersive, live environment including a pure, object-oriented programming language focused on simplicity and immediate feedback. See the ‘Pharo Syntax’ section of the article Rediscovering the UX of the legendary HP-35 Scientific Pocket Calculator — A tutorial on Pharo, test and specification based immersive programming for a quick overview of the Pharo language. How would you tackle these problems using your favourite language ? The internet is ubiquitous today. It should be dead simple to get the HTML source code of an arbitrary web page. The given String is converted (parsed) to a URL which knows how to retrieve the contents (resource) it points to. When evaluated using the ‘Inspect it’ operation, an Inspector tool will open on the result, a String. Date or calendar arithmetic can be tricky. It should not be, given the proper abstractions. Two Strings are parsed to Dates — note how the syntax of the dates allows for some flexibility. Subtracting two Dates results in a Duration, which knows how many whole days it compromises — 515 days. 3. Decimal digit length of 42! How many digits are there in the decimal representation of the factorial (!) of 42 (thus the product 1*2*3*4* … *42) ? In Pharo there is no limit to Integers, they can become as large as needed, just like in real math. These Integers are also quite intelligent, they know their decimalDigitLength for example — in this case, 52 digits. Like client HTTP functionality, server HTTP functionality should be easy. Here is one expression to set up and run a local HTTP server that will reply to all requests with the current timestamp. Much information in computers is represented as Strings. Being able to manipulate Strings in many different ways is thus important. Say we want to convert from a European to an American date format, textually. The above example first splits a String using a dash as separator. Then the order of elements is reversed. Finally they are joined using a slash into a new String. The result is thus ‘20/07/1969’ — the date of the first Moon landing. Many developers are more comfortable with their own programming language than with shell scripting. There is no reason not to try doing typical file manipulations from withing Pharo. Step one is iterating over all files matching a wildcard. For each of these files, we create a new file with a ‘png’ extension. We open a write stream, out, to the new PNG file and a read stream, in, to the existing JPG file. We use two helper classes, PNGReadWriter and JPEGReadWriter, to respectively write and read the PNG and JPG formats. We can use the built in prime sieve to give us a collection of the primes not larger than 64. Summing all numbers in a collection is just as easy. Even though Pharo is a high level language, it excels at low level bit and byte manipulation. ByteArrays are often given as hexadecimal Strings. These can be used to create a ByteArray. Manipulating a ByteArray is no different from manipulating any other collection. After making a sub selection, we convert the bytes in network order to an Integer. Unix time is defined as the number of seconds since midnight January 1, 1970 UTC. The DateAndTime class knows how to use this offset to create a proper instance. The answer is 2006-03-23T05:33:56Z. URLs are not only used to point to web pages, but to any kind of resources, including images. Retrieving such a PNG image and actually looking at it should be easy. Although the mathematical constant ∏ (pi) is an irrational number, approximately 3.141592653589793, there is a remarkably simple, easy to remember fraction that comes pretty close to it. Pharo works with true Fractions (objects holding the simplified nominator and denominator, keeping the full precision using unlimited Integers) as well as with Floats. The closeTo: operation compares any two numbers using limited precision — using about 5 significant digits. The above expression thus return true. Working with collections, like sets, should be simple and straightforward. Testing if one set is included in another one is such a simple operation. The above is correct, but maybe cheats a bit because all Collections in Pharo understand includesAll: — it is too easy. Another approach is to use the mathematical property that if one set belongs to another, their intersection equals the the original one. In this case the constant literal Arrays are explicitly converted to Sets. Note how we changed the order of elements to emphasise that their order is irrelavant. 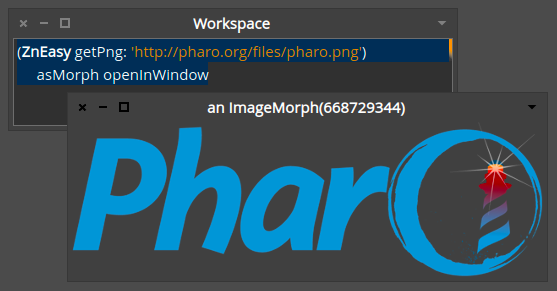 As a live environment, Pharo is able to show any object and will refresh its view when the object is changing. This allows us to easily construct a primitive digital clock. clock value: Time now ] repeat ] fork. Here we use a ValueHolder, an object holding another one, to represent our clock. We fork a process that will update the clock’s value every second. Note how we open the Inspector manually. This will show and refresh the contents inside the ValueHolder. It should be simple to load external libraries and frameworks from public repositories using good source code management (SCM) tools. Although this can be done using a UI tool, it should be easy in code as well. This simple expression results in ‘XML Support’ being loaded while resolving all dependencies and versions — behind the scenes, a surprising number of subsystems are working together to make this possible. Here is one way to generate a String containing random letters — selected from the first 6 letters of the alphabet. An empty String of the proper size is created and transformed by changing each element (each Character) with a random one selected from a given, constant String, ‘abcdef’. A simple question that should have a simple solution — Tuesday in this case. Converting (parsing) a String to a Date object gives us all we need: a Date knows its dayOfWeekName, among many other things. Mathematics can be beautiful and elegant, provided you can express things the right way. The corrected sample standard deviation is such a concept. It is the square root of the sample variance, which is the average of the squared deviations about the sample mean (about the average). Quickly saving the HTML source of a web page to a file should be trivial. Most programmers are familiar with grep, a Unix command line tool to quickly find the lines in a file or in files matching a pattern, often specified using regular expressions. Here is an implementation of a basic grep on a single file. The pattern String is converted to an object that knows how to match lines. The file is opened by taking its contents and converting it to lines which are selected when they match. Leap years can be tricky. How many leap years are there between 1914 and 1945? 8. Which are the leap years between 1895 and 1915 ? 1896, 1904, 1908 and 1912. (1914 to: 1945) count: [ :each | Year isLeapYear: each ]. (1895 to: 1915) select: [ :each | Year isLeapYear: each ]. 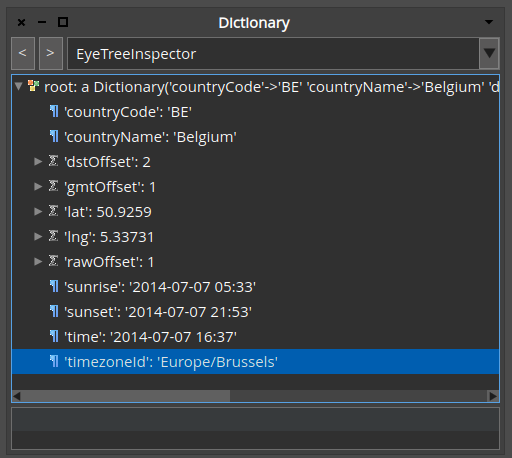 As a live environment, Pharo allows you to look at all objects involved in a computation. This includes the HTTP request and response objects. We can access the response object to find out which server is serving a particular web page — by consulting the identification String in the ‘Server’ header. Pharo.org is served by ‘Zinc HTTP Components 1.0'. In this case we are not interested in the result of the GET request itself, but in the response object. We also tell the HTTP client that it will only be used once — so that it can close the connections cleanly. A modern language should have Strings that can contain any Unicode character. Encoding these Unicode Strings as bytes for storage or transmission requires the use of an encoding. Pharo can encode/decode its Strings to/from bytes using multiple encodings. Here is how to compare the result of 3 such encoders. Web services or remote API’s can be found everywhere today. It should be easy to access such services and interpret the results. Below is an example of calling a web service offered by http://geonames.org for computing the timezone in effect at a certain location given by longitude/latitude coordinates. To be able to run this snippet, you will have to load NeoJSON and get a free account for your own username. The resulting JSON will be parsed as a Dictionary. The examples given here should be considered as scripting and interactive exploration of the computational capabilities of Pharo. Designing and writing actual programs in Pharo is another story and is necessarily a bit more involved. 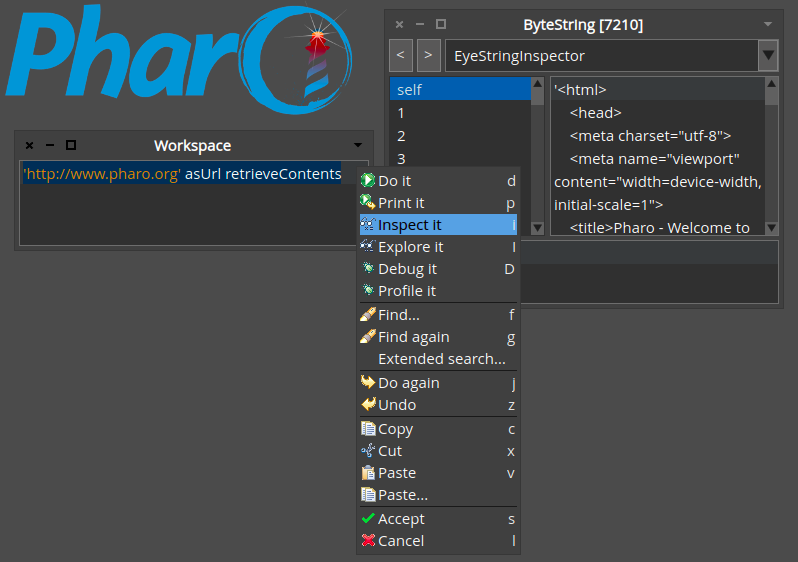 Furthermore, working in/with Pharo is a very interactive, immersive experience — involving code completion, syntax highlighting, code browsing, object inspection and debugging — that you have to try for yourself to appreciate fully. Hopefully these examples have piqued your interest — there is much more to discover, learn and explore. Head over to http://pharo.org and get started. I can guarantee you that it will be interesting.